Home › Event › Bonjour India 2017-18 opens with a grand spectacle at Amber Fort Jaipur. There are certains moments in life when words fail you. Magical and exceptional moments that transport you to another realm and get etched in the consciousness forever. 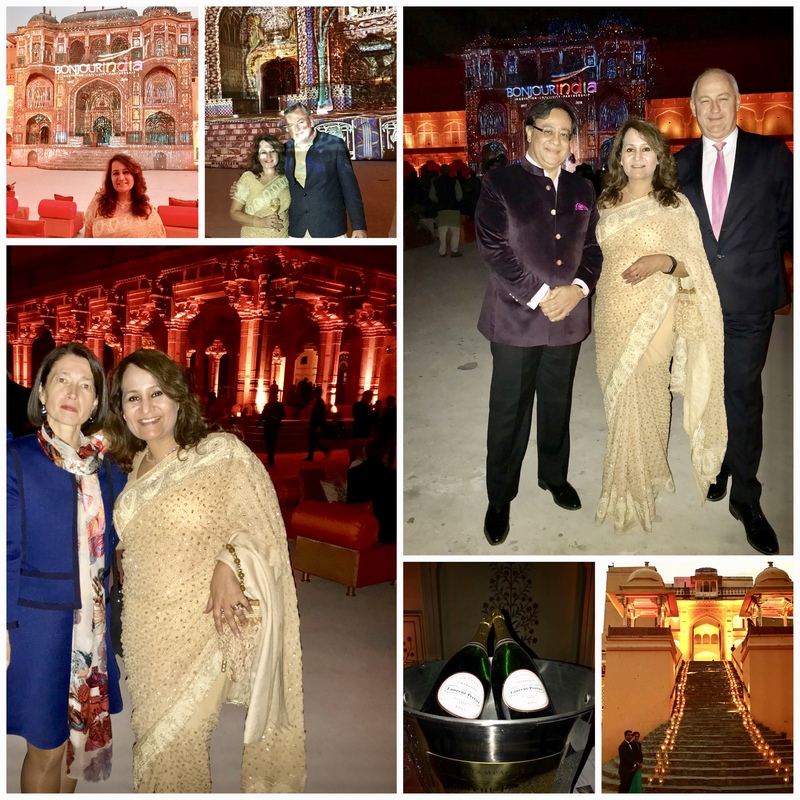 Those twenty minutes when French artist Xavier de Richemont’s monumental video painting Bhargal was unfolding at the inauguration of the third edition of Bonjour India 2017-2018 on November 18th 2017, at the historical Amber Fort Jaipur, was one such moment for me. It was the most mesmerising, enthralling and jaw dropping spectacle that I have ever witnessed. Bhargal, a video painting specially designed for the Grand Opening of Bonjour India by French artist Xavier de Richemont. This work of art tells the story of India and France as seen by the artist. 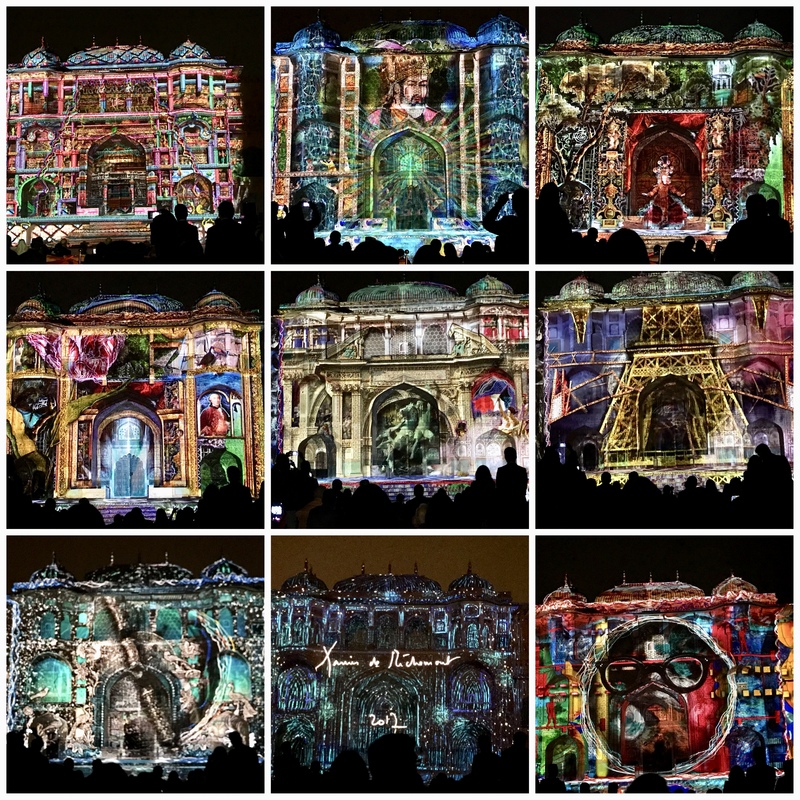 It visually encapsulated the friendship between India and France that thousands of words cannot express. The grandeur of two nations proud of their history and heritage, now working as strategic partners in the field of culture, science & technology, energy, environment, urbanism, education, defence and building a platform of innovation and creativity which lies at the heart of Indo-French co-operation. The presence of H.E Mr Jean-Yves Le Drian, French Minister for Europe and Foreign Affairs and Shri Prakash Javadekar, Minister of Human Resource Development India, at the opening of Bonjour India, shows how much importance the two countries attach to their mutual relations and shared goals. A special cocktail experience for the evening was curated by no less than Chef Alain Passard, whose three-Michelin-starred restaurant L’Arpège in Paris, has acquired cult status for creativity with vegetables, making him the poster-boy of vegetarian cuisine. In keeping with Chef Alain Passard’s passion for making vegetables central to his food, the menu at the inauguration function of Bonjour India comprised of exquisite vegetarian canapés made from locally-sourced bio-dynamic produce from Indian farms. He was assisted by Chef Ajay Anand and the staff of Pullman Aerocity New Delhi & Fairmont Jaipur. 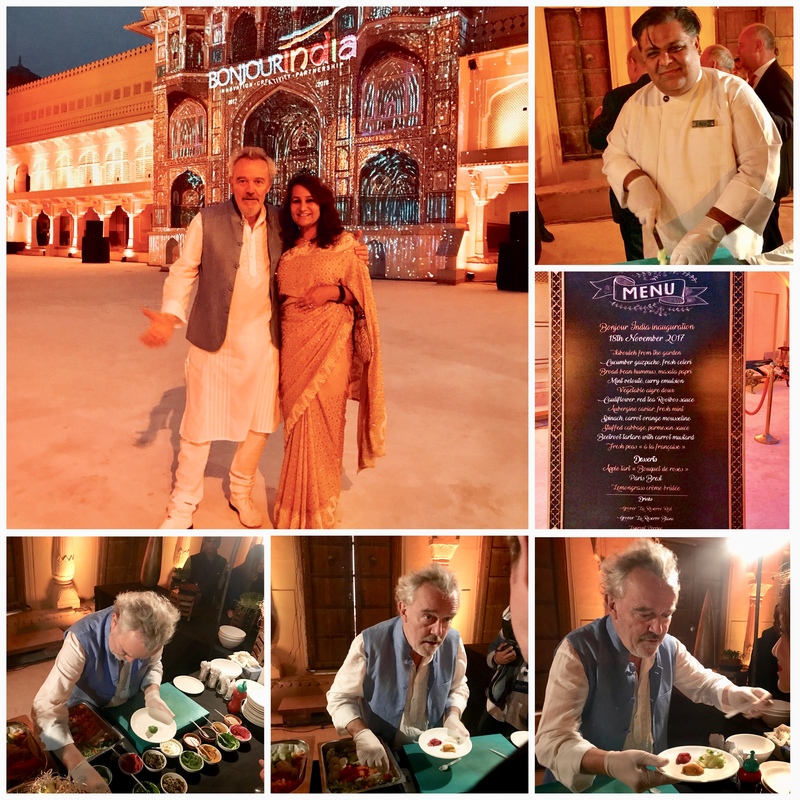 The wines that the celebrity chef chose to serve were Grover Zampa La Réserve Blanc and Red, that also features on the wine list of L’Arpège, where they are served by the glass. A huge validation for the quality of Indian wines and a proud moment for the Indian wine industry. While the wine served was Indian, the bubbly was French with more than 60 magnums of Champagne Laurent-Perrier consumed during the course of the evening. Jean-Christian De La Chevalerie from the House of Laurent- Perrier was present on the occasion. He made sure that the champagne never stopped flowing. With video painter Xavier de Richemont Top Right : Jean-Christian De La Chevalerie from Champagne Laurent-Perrier and Rajiv Kehr. Bottom Left: With Veronique Ziegler, wife of French Ambassador to India. It was indeed a privilege to be invited to this grand soirée by His Excellency Alexandre Ziegler, Ambassador of France to India, an experience I will always cherish. Over 300 programmes and events under its aegis will include film festivals, concerts, food festivals, debates, conferences, meetings along with educational and scientific exchanges making it a true celebration of Indo-French team spirit. “The Experience- A Journey with France” which lies at the core of Bonjour India, will trace the substantive nature of Indo-French relations. In the words of Ambassador H.E Ziegler “the youth oriented third edition is dedicated to innovation, creativity and Indo-French partnerships focussing on three main aspects : Smart Citizen, High Mobility and Go Green”.